The 2017 documentary No Stone Unturned is an investigation into what is known as the Loughinisland massacre — the 1994 killings of six men in a pub. When journalist Trevor Birney began work on director Alex Gibney's documentary film No Stone Unturned, he never imagined the job would lead to his own arrest. The film, which was screened Thursday at the National Union of Journalists in London, explores the 1994 Loughinisland massacre in Northern Ireland, in which six men were killed in a pub during the country's "Troubles." Nobody was ever arrested. It also detailed alleged police collusion with Loyalist paramilitary organizations, which a 2016 report by the Northern Ireland police ombudsman said was a significant feature in the killings. "When we began on this doc, we really believed that we were doing a service in pursuing the truth behind the deaths of six men," Birney told As It Happens host Carol Off. Birney and his colleague Barry McCaffrey were detained in Belfast in August and accused of stealing documents from Northern Ireland's police ombudsman that were used in a documentary. They are out on bail while they await possible charges under the country's Official Secrets Act and Data Protection Act. Birney said he was at home with his wife and three daughters when police arrived, demanding to search the house and question Birney. "They told us that it was in relation to No Stone Unturned and they were seeking documents," Birney said. "But after about 10 or 15 minutes, they led me into a separate room and told me I was under arrest and took me away." He was held at a police station in Belfast for 14 hours. "We never thought that the chief constable of police would react to our documentary," he said. The arrests were made in a joint operation between police from Northern Ireland and the northern British region of Durham. "The inquiry centres on the theft of sensitive material, which was used in a documentary film re-examining the 1994 murders," a statement by the police said, adding that the theft "potentially puts lives at risk." On June 18, 1994, three men wearing balaclavas entered the Heights bar in Loughinisland during a World Cup game and opened fire. Eleven men were shot in the back, and six men died. "All the victims were Catholic and the attack was quite clearly sectarian in its motivation," Birney said. Several years ago, the families of the men killed at the Heights bar asked the Police Ombudsman of Northern Ireland for an investigation. "He told the families the news they'd always feared," said Birney. "And that is that police had colluded with the killers. This wasn't simple incompetence, this was collusion. This was the finding of the ombudsman." But now Birney and his colleague McCaffrey have been accused of stealing documents to tell this story — a claim that Birney vehemently denies. "What we say in the film [is that] we were leaked a document in 2011," he said. "For police to say that we were involved in theft is really quite malicious. 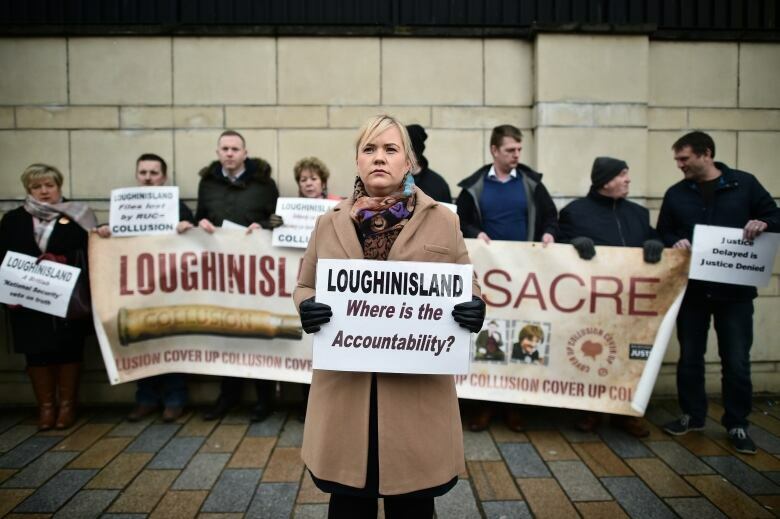 They don't like the fact that the truth of what went on in Loughinisland is now in the public domain, and instead of going after the killers, they've decided to come after the journalists." Written by Alison Broverman with files from Reuters. Interview with Trevor Birney produced by Sarah Jackson.